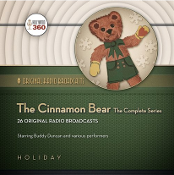 The Cinnamon Bear is arguably the best holiday series ever developed for radio. First heard in 1937, this wonderful Christmas holiday fantasy adventure serial was created and written by Glanville Heisch for children of all ages. It all starts with twins Judy and Jimmy Barton just before Christmas. Someone (or something) has taken the "Silver Star" for the top of their Christmas tree. The very Irish teddy bear, Paddy O'Cinnamon, comes to their rescue and tells them that the Crazy Quilt Dragon has taken the star to Maybeland. The three venture off to find the "Silver Star" and come face-to-face with many fantasy characters in Maybeland, including a dragon, a giant, a witch, a whale, a queen, a rhyming rabbit, a magician, cowboys, indians, and even pirates. The adventure concludes with a trip to the North Pole to meet Santa Claus himself! Many well-known radio actors lent their voices to this popular series, including Howard McNear, Gale Gordon, Verna Felton, Frank Nelson, Elliott Lewis, Lou Merrill and Joseph Kearns. Judy Barton was played by Barbara Jean Wong, Jimmy Barton by Tommy Carr and Paddy O’Cinnamon by Buddy Duncan. Now, in collaboration with the Heisch estate, we bring you all 26 episodes of The Cinnamon Bear on 6 audio CDs (7 hours in length), recorded directly from the original masters, for superb sound quality. 11/26/37 Episode 1: Surprised by the Cinnamon Bear. 11/27/37 Episode 2: Piloted Through the Attic Tunnel. 11/29/37 Episode 3: Stranded in Looking Glass Valley. 11/30/27 Episode 4: Captured by Ruthless Ink Blotters. 12/1/37 Episode 5: Outwitted by a Polka Dot Whale. 12/2/37 Episode 6: Frustrated by a Pelican. 12/3/37 Episode 7: Intrigued by a Treasure Chest. 12/4/37 Episode 8: Befriended by Pirates. 12/6/37 Episode 9: Upset by a Mysterious Force. 12/7/37 Episode 10: Approached by a Giant. 12/8/37 Episode 11: Scared by Yellow Flashing Lights. 12/9/37 Episode 12: Trapped in a Forest. 12/10/37 Episode 13: Threatened by a Witch. 12/11/37 Episode 14: Helped by Queen Melissa. 12/13/37 Episode 15: Foiled by a Crocodile. 12/14/37 Episode 16: Obstructed by a Deep, Dark Well. 12/15/37 Episode 17: Pelted With Mud. 12/16/37 Episode 18: Chased by Indians. 12/17/37 Episode 19: Confronted by an Angry Witch. 12/18/37 Episode 20: Lulled to Sleep by a Singing Tree. 12/20/37 Episode 21: Flown to the Land of Ice and Snow.